"Greetings Beloved Family! We are so, so delighted that you are here with us, standing with us in our circle on the Bridge of my ship, The New Jerusalem. I carry some rather distinguished passengers, well-known to you ­­­- Sananda, St Germain and others from the ranks of the ambassadors from the galaxy and beyond, the Masters, and you, Beloved Ones! "When you come, we stand together in our circle, in our organization, which is exactly that - it is circular. And why is that? It is because it is one unbroken Oneness, and because there is no one of us who is any more important than any other. Even I, Ashtar, absolutely relish the Oneness I feel with all of you, and the Joy that our coming together brings. As we have told you, you have an unlimited boarding pass – that’s right, there are no, what you call, black-out dates, you don’t have to have any certain number of, what you call, frequent flyer miles, you are welcome to the Bridge at any time!!! "Come and join us and feel the Love, because that is what is the most important thing for you to do. We are on this journey together. Make no mistake, you are traveling, as well as we. When you are in your home space, or your work spaces, or your enjoymentplaces, or whatever, you are traveling. You are travelers on the path to the Golden Age, you are travelers upon the Ascension Path, which will accomplish the Homecoming that you, yourselves committed to so long ago and in such a different time upon Planet Earth. "You were volunteers and when you came to put on the bodies of the humans, you put on the consciousness; that is, you created it, slowly, over what you call periods of time. 'The veil' is another way of saying this. You allowed the veils to be lowered to such a degree that you, yourselves, became citizens of the 3rd Dimension – oh the places you’ve been and the stories that you have, all perhaps still stored in your genetics, in your energy fields, but nevertheless, they are a part of you! "That which you call your past we call your timeline - we can see it all including that which you call your future. We tell you, you are bright, shining beings lighting up wherever you are, because you know something. Maybe not the entire story, because that’s pretty huge, but you know enough about yourselves and what you are here to do that you have allowed yourselves to move the veils aside, we shall say. "That veil may still be thick over your neighbor or your mother, or your son, or whomever, but for you, you have brought yourselves into a kind of freedom where the veils no longer exist for you - they might occasionally, particularly if you have a bit of frustration about seeing that the veils are quite thick for your mother, or your son, or your neighbor, or your boss, or whomever, but we assure you that you have, what you say, banished the veils from your own energy fields to such an extent that you are making great progress upon the Path that you are traveling upon. Each and every one of you!!! "Have you not noticed that which might have seemed an insurmountable challenge even in as little time past, as you measure it upon Planet Earth - let’s say at the beginning of 2013 - that which might have seemed an insurmountable challenge is not a challenge any more. It might come up again, it might still be there, but you are moving through it, or over it, with ease and grace, much more so than you have experienced at other times in your lives! "For some of you the challenge is not coming up any more because – guess what? – you don’t need it anymore! This is indeed absolutely de-Lightful, is it not? It’s of the Light!!! You know how to bring yourselves to the Light, you know how to bring the Light into you own beautiful Hearts, and you know how to utilize the Light. We’re talking about Love here, by the way. We don’t want anybody to be confused about what we mean. We’re talking about the energy of Love! "It comes from the great central sun, it’s relayed to you through your sun, and of course it feels lovely, does it not, to allow yourselves to go outside and dance in the sun or simply to hold out your arms and say, 'Ah, how glorious!' It is warm, it can seem to be nurturing or caressing. Is that not part of feeling loved? So there you have it. You have Love, it is a most powerful energy; as a matter of fact it is the most powerful energy of the Universe and it manifests in Light, so we call it LoveLight! "That’s simple enough, is it not? And there’s a lot of it here on the Bridge, because you came, and because you bring it with you, and because you exponentially increase it when you smile, when you offer a bit of a helping hand to pay it forward, when you feel a Lightness within yourselves! That’s a bit of a play on words, is it not? We were saying Lightness, as in feeling uplifted, feeling almost as though you’re flying when you are feeling as though you are without any heaviness. Of course, what’s doing it is that you are lighting up with the Light of Love! "So there you have it, if you want to feel light, let the Light in more and more. Call it forth! We want to emphasize this, this is not where you are a stationary, immobile, unfocused, no concentration whatsoever being, just kind of moving around with your blinders on, on your paths. You won’t get far if you are not moving, right? So if you are just sitting around on your couches, and that’s good to do at times - we all need our relaxation, and even we relax, we have fun times, we’ll say - but you need to be conscious about your moving. You need to be visioning yourselves as having arrived fully!!! "If not arriving totally in your Lightbody, or your crystalline body, into that High Dimensional space where everything is no more, then bring yourselves to the Golden Age. That is a great place because, guess what, that’s our destination tonight on this call! We want to talk about the Golden Age. We want to talk about what it means and how you look in it, because that’s real important. "Don’t you want to know how you look in the Golden Age, and how you fit in? Now, the word 'golden' is a big clue, is it not? When you think of Light, and bright Light, and shining Light, and powerful Light, don’t you sometimes think of golden Light? Maybe not always - as we said Light is all colors - and there is the golden-white light of the Christ. That is a familiar concept, is it not? A familiar vision? "So when you think of Light, you can associate that so easily with what we are calling the 'Golden Age.' Now, what is the Golden Age? It’s a stopping place for you, a place where you can really soak up more Light on your way to full Ascension. It’s a place where you will have partially ascended already, and let’s face it, you have!!! Are there some of you who have not realized that you have partially ascended? Well, we want to tell you that you have, because you are living in Higher Dimensions than 3D! "What do you think happens when you go to sleep, in your slumber times? Where do you go when you meditate? Where are you, in other words, where are you taking yourselves, if not into a Higher Dimensionality - and we’ll call it a Higher Reality. In fact, we’ll tell you right now that 3D, what there is left of it, isn’t so real. It’s a game, we’ve talked about the chess players in the human bodies that are alive - because they are not all humans, but they may have human costumes on to cover up their true identities - and they are being removed from the chess board even as we speak! "It’s all exactly as it’s meant to be, it’s all in Divine Order! Even though you may realize that 3D still has reality for you, we’re here to tell you right now that you are all in the Ascension process and you’ve all made it into Higher Dimensional Reality, which is the True Reality by the way - all this 3D stuff is just whatever you’ve made up - and you are spending more and more of your waking moments in the Higher Reality because you are noticing, for instance, that you are not having as many challenges, and what are left are easier for you to find your way through. For most of you, it’s swimming on top of the waves rather than being buried by the currents, and so on! "We love to give you examples, and we like to paint pictures so that you can actually put yourselves into that particular vision. What we are here to tell you is, Congratulations!!! Let’s celebrate! You’ve made it to where we are. That’s right, we’ve talked about your boarding passes to the Bridge of The New Jerusalem. The New Jerusalem is parked in a Dimension which is greater than three. Now, we do a little moving about, you know what warp speed is, right? Two 45 degree turns make a 90 and you’re in a Higher Dimension. That’s what warp speed is - it’s just jumping Dimensions! How about that? "Well, we can’t get too scientific because The Voice doesn’t like it, so let’s get back to Love, shall we? We are talking about the Golden Age, and that is an Age of Love. You aren’t going to find anything, really, besides Love in the Golden Age! Now, the entry to it is actually where some of you have already gone. "Let’s compare it to the opening of a store . You have the grand opening where everybody gets to go - that’s NESARA’s Announcement, followed by the Announcement of our presence, followed by the solutions that NESARA brings to the World being implemented, along with the solutions that we bring, like cleaning up what remains of the radioactivity! And there’s a lot of that still, but it is becoming less and less capable of harming you as individuals, because you are spending more and more time in Higher Dimensions where radioactive toxicity does not exist - how about that?!!! "This is two things: Number one, it is what you do to eliminate challenges, diseases, disablements, problematic relationships and so on; you are eliminating them from your beings because you are moving up into the Golden Age more and more, where these things do not exist. And number two, you are already moving into the grand opening, but not completely, because the World has to join you at the grand opening. But it is called a soft opening, where people get to go into the store or business before the grand opening. They open up just to let people in that are aware and tuned in, so they have what is called a soft opening. So that is where we are, you are in the soft opening of the Golden Age!!! "Even though you may not feel as though you are there yet, is there something in your life where you can say, 'Yes!'? Perhaps you found a way to increase your income without having to increase your work hours. Or as one person said 'I’m so happy all the time that I don’t work!' Because you are in Joy with what it is that you are doing. "The Golden Age is about Abundance for everybody in every category! The Golden Age is about the new technologies and the complete clean-up of whatever pollutions there are, so that all of the human World and all of Mother Gaia’s kingdoms will be in en-Joyment of it - not just those of you who have come on in a bit early. It has to be for every kingdom member on Planet Earth. "Now, we are not going to get into the fact that some kingdom members who are here now aren’t going to be there, you already know that. We’re talking about, what is the Golden Age for you? It’s the ability to know that you are Masters of yourselves! You don’t have to be Masters of anybody else, just of yourselves and your own lives, your own lifestyles. It’s the ability to enjoy so much Abundance, which is emanating from St. Germain’s bank in various ways, that you’re not going to worry about whether your social security check is in the mail or whether you can pay your mortgage, because you won’t have any for your living spaces! "There will be ways of getting funds for businesses, but everybody is going to get a payout from St Germain’s funds, which is a one with forty zeros after it, and you can divide that by seven billion humans in the world - because the animals will be receiving the benefits of what you receive - but it will be all of the members of the human kingdom who are present on the Path to the Golden Age who will be receiving this Abundance! "A lot of the suppressed technologies will be able to come forth, and absolutely bloom and proliferate across Planet Earth! There are those right now in the human bodies who have the answers - they may be from some place else and have brought the technology from their home planets with them, but they are in human bodies - but they are so ready to step right in and greet you as you move fully into the Golden Age, there will be no more diseasements, there will be ways of restoring your total vitality! "What do you want to be, thirty something? Maybe forty something? Because, you know, you may think in your own mind that you don’t want to lose any of the wisdom that you’ve gained. You can be any age you want, you can have any color of hair you want - or not! You can be in full expression of your God/Goddessness, your Divinity, and everybody else is going to be on your wavelength!!! Now that’s the Golden Age and that’s who you will be – a bright shining member of humanity in the Golden Age, and that’s a lot different from 3D humanity! "Greed will not exist there; helping your brothers and sisters will exist there, rather than taking advantage of them or being envious of what they have, because you can have whatever they have and they can have whatever you have! We mentioned a while ago, replicators - think of the Jetsons' robot, think of Rosie on the Jetsons. The ability that you have, as you recognize the Divine Beings that you are, to simply wave your hand, twitch your nose or do some other creative process - and there it will be!!! "As you ascend you will eventually be into 'beam me up Scotty' - only you will not need Scotty! Meanwhile, in the Golden Age, that which you call space travel – wooo - doesn't that sound exciting – you’ll be able to get on a ship and you’ll be able to enjoy your own shuttles! You can still come up to The New Jerusalem simply by bringing yourselves here out of your bodies, but you will have the full embodied experience, if you want it, on the ships!!! "By the way, you are going to have all of this money, but in the Golden Age, as you move into it fully - and move on towards your own Ascensions, because everybody may have different destinations, plans, commitments or blueprints, and so on, for the next phase - there will be no money. Remember, if you can beam yourself up without Scotty, if you can twitch your nose or wave a wand and manifest and create whatever it is that you desire, and if there’s no more taxes to pay - that’s a good one isn’t it! - why on Earth would you need money??? "That’s a good question! Notice how I phrased it – why on Earth – because there will be no more money on Planet Earth. Now, there will be gold aplenty, but it’s a different kind of gold, it’s the high-vibe spiritual gold, it has ORMES, and that will be within you. You’ve already got ORMES, you’ve got your very own ORMES factory within your beings, Beloved Ones, and it will be going full speed ahead because that’s how you are going to get into your crystalline bodies and that’s how you are going to ascend! "What is ORMES? It’s a mouthful. It’s called Orbitally Rearranged Monoatomic Elements in the high-spin state – ORMES. That is the collective name, a single ORMES is an ORMUS. It was discovered by David Hudson. It’s a higher state, it’s the crystalline Light body state of gold, sliver and other metals. You will find them on the chart that shows all of the elements - it’s in the subject of chemistry. If you want to know more about ORMES, you can google it, look up David Hudson. It is found in aloe vera juice, we recommend aloe vera. We do not recommend powdered ORMES - you can overdo! David Hudson did and others have done so. "So we recommend if you want to start bringing more ORMES into your crystalline-forming bodies, just drink some aloe vera juice every day. Test-guide yourselves. There are other foods that can have it. ORMES is basically found - and there are different forms of it - in plants which are grown in volcanic soils. So there’s a hint for you. But you can find it in aloe vera juice, and it is advised that you get it as pure and organic as possible so as to not destroy any of the good things in it, and so on. "Now that’s just something that you can do to further your travel on the path because, remember, you are not just traveling to the Golden Age - you’re going to experience the Golden Age, live in the Golden Age and complete your Ascension process at some point. If you want to take a short cut and ascend before the Golden Age grand opening, that’s okay too. You can do that, you do not need ORMES to ascend - it is just simply something that can assist you in the formation of your High Dimensional bodies. It’s a High Dimensional element, and the reason we recommend aloe vera juice is so you don’t overdo it. "Those people that were pioneers who started out with the LSD, some of them went over the edge, over the top. ORMES is different - it is not LSD, do not make that jump - but what we are saying is that you can overdo it, that’s why we don’t recommend the powders, we recommend aloe vera. It might seem like the slow road but you are already far enough along, and it will make a difference for you if you choose for it to. You can also get an aloe vera plant, put it next to where you sleep and invite exactly the right amount of ORMES to come into your being from that plant. It’s an energy transfer, and that’s a good way to do it - it’s all Love!!! "High Dimensional energy is Love - there is nothing that is not Love allowed in the higher dimensions. What are we talking about? You want that qualified – okay. We’re talking about high 4D and above. Why do we say high 4D? Well, you know, there’s the Astral plane and there are some guys that hang out in the lower Dimensions - just bypass it when you do your travels. Just invite one of your guides - I’m always available, I love being a tour guide - so just invite one of your guides to take your hand and fly with you and bypass whatever there is of 3D for you to travel past and lower 4D and you can also say that you choose to travel with your Divine self and your Divine guide and nobody else is invited! We’ve given you some descriptions of what to expect. "Let’s talk about NESARA. NESARA is something you’ve been hearing about for a long time. 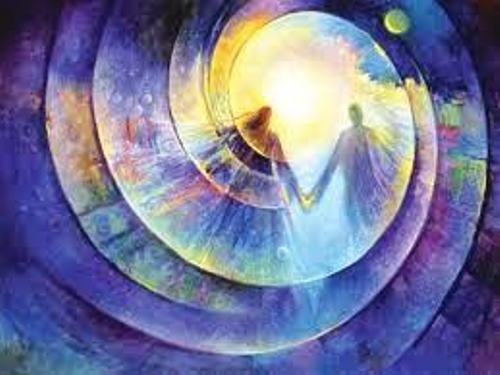 It is divinely inspired, it follows Divine and galactic law and it follows the laws of Love. Why NESARA? Because those guys have just gotten so used to having all this power and control, they simply will not keep their promises. They promised, they contracted to leave and they didn’t and they are still trying to hang on. NESARA was conceived before the year 2000, it was signed into law by two presidents - it is the law!!! "It is not just for the United States of America, it actually originated and was written by certain beings in Congress, but it is for the whole World. It was written and passed into law for the entirety of the whole world to follow. It has yet to be announced formally, and until it is formally announced it is not adhered to. But you can accept NESARA into your beings, you can follow the integrity path of NESARA, you can understand it!!! Go to our website** - there is a full explanation. "We have mentioned some of the things that will not be in existence in the Golden Age, and that there will be Abundance for all. NESARA’s Announcement will clear the debts and do away with them once and for all. We will not take a lot of time, if you have forgotten the basic tenets of NESARA go to our website, go to Masters Tara and Rama,*** tune in to their shows or go to their archives or whatever you want to do - you’ll get the full picture. "NESARA is the National Economic Security and Reformation Act, and oh boy, will it reform!!! There is no place under NESARA law for the greed, for the manipulations of the economic system or for the oppressive laws which will be instantly gone. Say, 'Bye-bye. Thank you for teaching us what you had to teach us and we no longer need your Patriot Act, Homeland Security, TSA, Black Ops, and so on, because their time is over!!!' None of that will exist and everybody will be free in the Golden Age and those things will not be needed. Everybody will be in a Higher level of understanding and Love! "You can’t get any higher than Love, but what we’re talking about is that humanity is rising in its own consciousness and so the more that we gather on the Bridge – bring yourselves up anytime – the more that you sit in your sacred places and take 30 seconds or 30 minutes or whatever to send that Love You Are -beam it out, share it, pay it forward - the faster these things will come to all of 3D Earth because they are in existence and they are just waiting to burst upon the stage!!! "There is a divine inspiration for NESARA, we call her Lady NESARA. She stands with Lady Freedom and we have given them the female because we want people to feel the nurturing that they bring to each and every being, the Goldenwhite light of the Christ and all of the Joy that everyone deserves! As these dark hat ones leave the stage to make way for Lady NESARA and for Lady Freedom and for the Masters and for Yourselves to take center stage - how about that? – to stand together with you in total connected Oneness - it is to send Love to everyone, dark hats, white hats, gray hats, any shade in between. "We are going to ask you to do one more thing. We have asked you before, and we are going to ask you to continue, particularly, sending that Love to President Obama and the NESARA announcers. He is not the only one, but he is the leader. There are others who are so anxious. If you could see and feel - stop for a minute, feel the Love that these ones have for you and for everyone in the World, everyone on Planet Earth, and it radiates clear out to the Universe! Feel the Love that these Announcers have, feel their anxiousness to come and serve as the Announcers. They have been longing to do this for years upon Planet Earth!!! "The stage is almost ready for them to move onto it and to officially announce the grand opening of the Golden Age! Send them your Love and support. You only need to know that President Obama is what you might call the lead Announcer. He has a lot of advisors and they are not all in human bodies, and this is entirely appropriate - we and our representatives are with him!!! He has a very, very highly evolved group around him who are occupying human bodies as far as the World is concerned, but they are from Higher Dimensionalities - they have brought themselves to Higher Dimensionalities! "We do not need to go into this, just know that Obama knows what he is here to do. He made a speech today**** that was addressing and explaining the situation from the 3D perspective, because that is what he has to do. Read between the lines, go back and look at the speech, look into his eyes and allow yourselves to feel the great Love that he is and that he projects and sends to all. Send it right back to him!!! "If you can find time, send emails to the White House - you can find how to do it on our website, do it. Speak up and use 3D methods as well as Higher, because remember, not everyone there understands the Higher Dimensionalities! It is for the people around him to read your communications and get the gist of it, and it is for him to be told about your communications if he does not have time to read each and every one. "What if somebody said, 'Oh my goodness, we received one thousand - or ten thousand - emails today saying let’s open the Golden Age, let’s announce NESARA now,' or, 'tell the world that the Ashtar Command is here,' or whatever. This is putting your Hearts with his. Make no mistake, a 3D action is very important! Sign petitions, start petitions, do whatever you are inspired to do and do it on all levels, from 3D on up to your very Highest Self, and that, Beloved Ones, is how we can work together to get this done!!! "Well, this has been so de-Lightful! I am so excited to have you here with me, and guess what? We are going traveling again, because we will be welcoming Sekhmet here to take us to her ship, which is The Niburu, and it is a crystal ship with some rather magical and wondrous capabilities, and we shall empower the Golden Age and NESARA together in our circle on her ship! "So I, Ashtar, tell you again, we see you all, we love you all beyond words, and We Are One with you. And so it is. Salut!" * The complete text of Ashtar's transcript is contained here. ** Ashtar was introduced by his chosen song, Come, The New Jerusalem. *** Click for NESARA information - scroll down.